What two things do Sir Steve Redgrave, Sir Ben Ainslie and a postman from Tiverton have in common? They each competed at five Olympic Games and are arguably the greatest exponents of their respective sports that Great Britain has produced. But while Redgrave and Ainslie have nine gold medals between them, postman Chris Maddocks is perhaps most famous for finishing last in front of 100,000 people at the 2000 Olympics in Sydney. He has been to more Olympics than Sir Chris Hoy, Dame Kelly Holmes or Linford Christie - but now pounds the streets of Devon delivering mail. "I get paid for covering a lot of ground," he tells BBC Sport. "It's at a lot slower pace, so I'm not the fastest postman in the west, but it probably prevents me from becoming incredibly fat, so it has its bonuses." 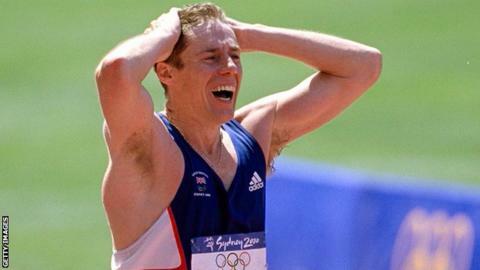 Maddocks' most famous moment came 16 years ago in his final race - the plucky Brit finishing an hour behind the winner in the 50km walk - but Maddocks insists he was no 'Eddie the Eagle' or 'Eric the Eel'. "I was a good athlete and I was Olympic standard, I was just injured. I just did the best I could on the day and I was in trouble from the very first step," he remembers of his final race. Just seven weeks before Maddocks had torn a buttock muscle while training and he was advised not to make the trip down under. "I was in great shape in the lead up to Sydney, I'd qualified by winning a race in Holland in the March of that year. "They said I should pull out, but I wasn't going to give up the Games easily, because this was likely to be my final Olympics," he says. "If I was keeping anyone out of the team, maybe I would have pulled out and a reserve could have come in, but that wasn't the case, it was either me or no-one, and I saw no point in having no-one on the line." Come race day on 29 September 2000, Maddocks doubted if he could make the five laps around the track at Stadium Australia, let alone the 31 miles around Sydney's streets. But as he toiled in the Australian sun, dropping further and further behind, little did he know that his progress was being followed by those inside the stadium via the big screens. "I was so far behind I reasonably assumed there'd be no-one in the stadium, but I wheeled up onto the track and there was an absolute wall of sound. "What I didn't realise was that my painful progress had been followed on the big screens in the stadium and people had stayed behind from the morning session to see me finish. "Instead of it being an empty stadium, 100,000 people sang along to The Proclaimers' '500 Miles' and my legs turned to jelly." Cult status followed, and his scrapbooks are filled with cuttings about his most memorable achievement - although it was far from his best. Having missed out on selection for the 1980 Olympics in Moscow, when Britain sent a smaller squad than usual and other countries boycotts the Games because of the Russian invasion of Afghanistan, he did not make his debut until Los Angeles four years later. He twice finished 16th at the Olympics - on his debut in the 50km walk and eight years later in the 20km event in Barcelona. "I walked 83 minutes in Seoul, and then it only got me into the 20s, but if I'd have produced that in LA four years earlier it would have been good enough for close to a bronze medal," he recalls. Now 59, Maddocks' British record mark of 3 hrs 51 mins and 57 secs for the 50km still stands to this day, nearly 26 years after it was set, while his 20km record was only broken three months ago, having stood for 28 years. But while he is something of a forgotten hero at home, he does return to the limelight every four years, using his expertise to enlighten US Olympics fans about his chosen sport. "I was honoured in 2011 to be approached by NBC on American television who were interested in me commentating for them on the three Olympic walks (at London 2012). "My wife took the initial call and rang me up when I was posting letters saying 'we've had an approach Chris, I've taken the executive decision on your behalf that you would be interested'. "I must have done a good job as they came calling again recently and they want me to do the same role as co-commentator and expert analysis for the Rio Olympics, so for me that's a fantastic way to stay involved at the highest level with the sport that I love."